This article has been arranged so the shipping container house plans are first, because that is probably what you want to see. Below the plan information are a number of tips and issues to familiarize yourself with so that you can make good decisions before you spend a lot of money on the containers and getting the contractor help you might need. A very simple design for a cabin or hunting structure. This plan also has a living room and a lounging deck, which isn’t common. 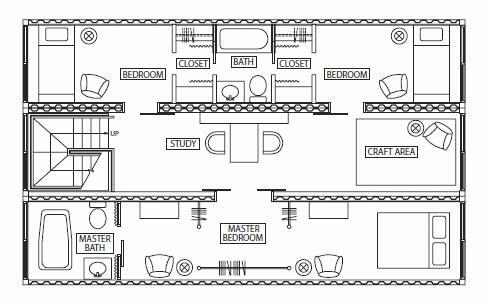 This plan is for a single-level 720 square foot home using two shipping containers. It also includes a 16′ x 60′ porch. The foundation uses a post and pier arrangement. 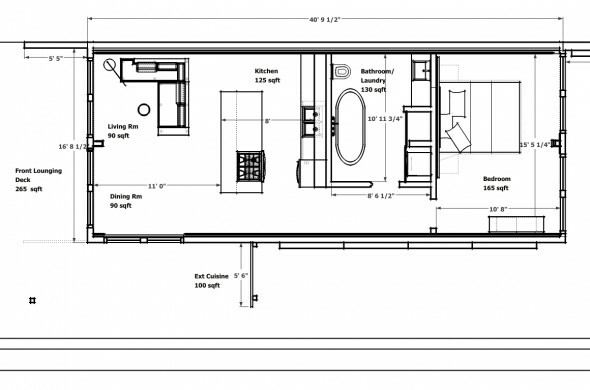 This plan uses two forty-foot containers places side-by-side and has two bedrooms. There are 3 plans here for one-bedroom container spaces. Two are 20 feet long and 8 feet wide and the last one is 40 feet long and the same width. This plan uses 3 containers and has two normal-sized bedrooms with a master bedroom. There is a bathroom for the 2 bedrooms and a master bathroom for the largest bedroom. There are also areas for a study and crafts. 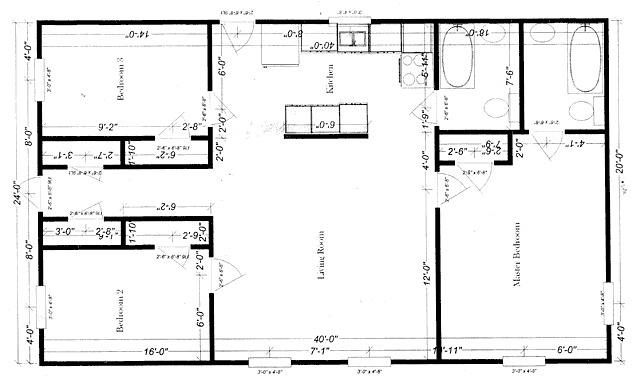 This 960 square foot plan has 2 bedrooms, a living room and a dining room. This one also has a largish living room, which is 16 x 24. Generally, with a container home, one might not imagine having such a large open space, but this plan has it. This plan uses 4 containers placed next to each other, but with some space between. It has 5 bedrooms, with a family room, living room, study and dining room. These are all small, single-container plans for the economical budget. You might have to zoom in to see them more closely. This page has 15 container plans, including a plan for a 5 bedroom structure and one for a commercial space. Building a shipping container home can be an adventure and a good way to save some money, but only if you know what you are doing. If fact, some shipping container houses have cost $200,000 or more, so it pays to do your research first. Make sure you buy containers that are in good condition and that you see them before purchasing. Make sure they have not been used to ship hazardous materials like toxic chemicals. See if you can get the newest ones available, like a one-trip container – sometimes they don’t cost that much more. Know the relevant regulations in the area where you want to build – planning, zoning, and building codes. Use a contractor or contractors who have previously worked with containers. Learn how to properly insulate your containers to keep out cold air and the elements like rain, and to manage condensation properly. Make sure the containers you purchase are structurally sound, in other words no rust, cracks or too many dents. Make sure they were not sprayed with toxic chemicals such as pesticides or disinfectants. If they are going to come from another country, sometimes nations outside the US don’t have the same environmental laws, and they may allow chemicals in containers that would not be used otherwise. Have a clear understanding of what is required to move and situate a container, or more than one, because they are very heavy. The paint used in some containers has phosphorous and chromate in it — these chemicals might be harmful to humans. So, you would obviously want to inquire about what kind of paint was used on a container you are interested in purchasing. Also, many containers have wooden floors which have been sprayed with pesticides, but you would not want to be exposed to such chemicals in your own home for obvious reasons. However, there are some containers that are made from scratch for the purpose of residential construction. Mesocore is one company that does this. 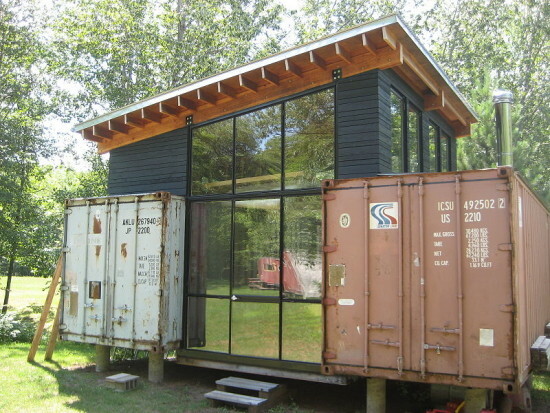 What are some of the advantages of using shipping containers? If you can find the right ones, they will be in good condition and therefore should last a long time. They are also very strong and very heavy, so they should be able to withstand just about any kind of storm — unlike an RV or mobile home. Using shipping containers to make a home or cabin in a more remote area should be quite a bit cheaper — this seems to be the main reason people like them. Also, you will be recycling existing material to make your home, rather than using brand new material, so it is a more environmentally friendly process. By using existing steel, you won’t be utilizing any lumber made from virgin forests — so no trees will need to be chopped down. Because shipping containers are sort of modular — meaning that they were designed to be stacked — you might consider getting one or two first and creating a smaller structure. Once you have become familiar with them and how they are built, you could consider adding more later. Of course, if you want a smaller home, then don’t add any. Smaller homes are easier to manage and there is less cleaning, so you will probably have more free time. Another advantage of building with shipping containers is that you mostly likely won’t have over-invested in your home, so you should have more money for land, if that is your preference. With more land, there may be more space available for growing your own food, which can save you money, and gardening is a good way to relax and get some gentle exercise. A potential disadvantage is that a shipping container home might be harder to sell because it is unconventional and a certain amount of education could be required when you are selling it. It obviously would not be a cookie-cutter home in the suburbs, so some people might see it as being ‘weird’ or perhaps troublesome. Also, some people simply don’t want to do different things or be labeled as being different.